Tina Turner had a popular song called, “What’s Love Got to Do With It”? You may be asking yourself this same question. What ‘does’ love have to do with weight loss? When you love God and love yourself, your entire weight loss journey ceases to be one of striving, struggling, and stumbling and is replaced with a passion and drive to want to honor God with your body—because of your love for Him—and to love yourself enough to honor your body. The scripture above tells us that everything should be done in love because God wants us to understand that love is the foundation for everything we do. Without love at the center of everything, you will quickly lose motivation, focus, and passion for achieving your weight loss goal. If you're not inspired by God's love for you, your desire to lose weight will quickly lose steam and fizzle out because your motivation has to be grounded in something deeper than your own wants and desires. God calls us to center our lives around Him. 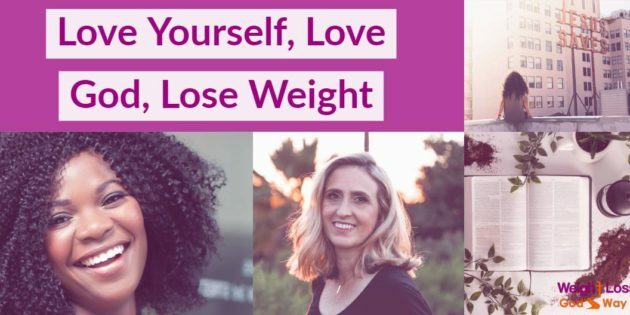 If you're not motivated by a love for yourself, your desire to lose weight can feel like a punishment, burden, or never-ending cycle of trying, failing, guilt, shame, condemnation, and trying some more. It’s God’s love that encourages us to want to be the best version of ourselves so we will stop abusing our bodies with unhealthy foods that harm us. And it’s His love that offers us the peace, joy, and freedom that we’re forever seeking. The freedom we’re searching for in this life will come from an understanding and acceptance of God’s overwhelming and steadfast love for us. Maybe you never thought about it before. Ask yourself, "What's my motivation to lose weight? Is it grounded in love?" If not, what can you do today to make your journey more about love and less about striving and struggling to reach a certain weight? Dear Lord, I thank you and praise you that you are love! You don't just 'do' love, you 'are' love! As I begin thinking about my health, thank you for reminding me that it starts with love—loving you and learning to love myself as you love me. I give myself over to you entirely. I come to you today with a mind open to transformation and a heart open to receiving the incredible fullness of your love for me. Help me to set aside a special time each day to learn how to receive your love. Your Word says that you love me with an everlasting love and I want to experience that. I want all I do to be done in love. Thank you for loving me enough to never let me go—to never forsake me and to never give up on me. Teach me how to have that same love for myself. In the beautiful name of Jesus. Amen. Be sure to share your comments below. I needed this today…a day of candy and “love”. However, candy isn’t love and I need to learn to love myself better. I want to find out more about my next steps with Weight Loss God’s Way. Thank you! What a great post for Valentine’s Day today. I love the “God’s love..” statements, gonna make that my journal study for today. Thanks! Wow good word! Thanks Cathy!